Imagine having a whole box of fresh peaches to share with your family. Eat them at the kitchen table nice and neat, or out on the lawn with juice dripping off your elbow! You could freeze or can some too. Most peaches are heavily sprayed, but we buy from growers that follow IPM practices and spray minimally, so you can feel good about giving our peaches to your children. Sometimes, we offer organic peaches, too. We offer peaches starting as early as May and as late as August or September. You can see what’s available now by checking our current order forms, or sign up on our email list, and we’ll notify you when it is time to order. 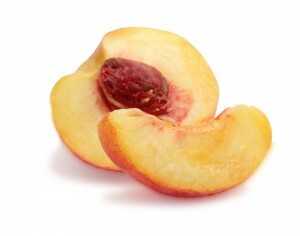 Freestone peaches have a pit that pops out easily when the peach is ripe. They’re great for canning and freezing because they’re just so easy to work with. Of course, they’re even better eaten fresh, with juice dripping down to your elbow. What’s a Cling Stone Peach? We get several loads of Georgia peaches starting in May and running through mid July. This first load or two are cling stone fruit, because that’s the type that ripen first. Cling peaches have a pit that ‘clings’ and doesn’t pop out easily. When you eat a cling stone peach you have to creatively navigate your nibbler around the seed. So if you don’t think that sounds fun then you’ll want to wait until next month for the free stone peaches. How are These Peaches Grown? It’s pretty unheard of to grow true organic peaches here in the southeast corner of the USA, so we looked hard to find the closest thing to organic possible. We absolutely love the orchard we found! They are willing to talk freely about their growing practices, and we’ve found them to be particularly careful to grow as naturally as possible. This growing method is commonly called Integrated Pest Management. You can read more about it by clicking here. Our family is especially set on organic peaches, or at least something close, so we hope this helps you out as much as it helped us to speak with the wonderful people at this orchard. Number 2 peaches are either small or else imperfect, whereas the number 1’s are more uniform in size and unblemished. 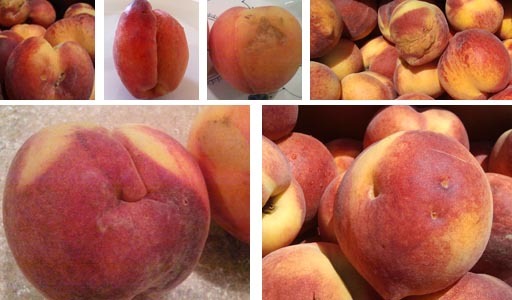 The photo below shows a few different examples of the imperfections you may find in your box of number 2 peaches; peaches with strange or elongated shapes, a groove where the fruit grew next to a twig, discoloration or a rough patch on the skin, a dent where the peach was hit by hail, or sometimes a small cut. And occasionally we can’t tell why a peach was considered a number 2, because to us, they look just fine. Our neighbor Wilda has an easy, reliable way to store peaches that keeps her peaches fresh considerably longer than refrigeration alone. Last summer, I think she and her husband were still eating fresh peaches 4 weeks after she picked up her box from us! All you need to do it yourself is some paper towels and a couple plastic grocery bags. Place a few paper towels in the bottom of one of the grocery bags, then set a layer of unripe peaches into the bag. Add another layer of paper towels and another layer of peaches on top of the first, then top it off with one more layer of paper towels. Now slip another bag over the first to loosely cover the opening and you’re done. Just set the bag gently into the fridge. You’ll want to peek into the bag every few days to make sure all your fruit is still sound. Store the unripened peaches in the refrigerator until a couple days before you’d like to eat them. They’ll keep longer when refrigerated unripe. To ripen, just place firm peaches on the counter for a day or two. Prepare a cold water bath, either in a sink or large bowl. Place the peaches to be peeled in a colander, or basket, or drop them directly into a deep pot of boiling water for almost one minute. 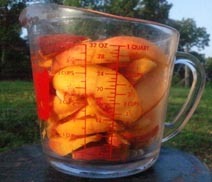 Make sure that each peach is completely submerged and that they are free enough for water to flow all around them. After one minute in the boiling water, immediately plunge the peaches into the cold water bath. You may need to change the water or add ice to keep the water cold. The skin should come off the peach very easily now, just like peeling tomatoes. 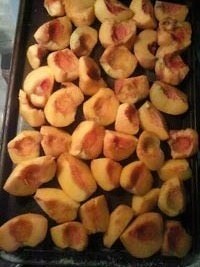 We like to cut our peaches into quarters and freeze them on cookie sheets. Once they’re frozen, we put them into gallon freezer bags. This way the peaches won’t freeze together as one big block. Since we make smoothies in our powerful VitaMix, we don’t bother to peel the peaches. Check out our favorite peach smoothie recipe, Orange Peach Sherbet Smoothie. Put whole peaches in hot water until the skin slips off. Then put the skinned ones into a big bowl of water you’ve prepare with ascorbic acid (¼ to ½ teaspoon ascorbic acid per 2 cups of water) or lemon juice. Cut into slices or chunks and place into quart bags. We’ve found that one quart bag stuffed full makes a perfect size pie. We don’t add sugar to freeze them, and it works just fine. In a hurry to get them frozen? We’ve tried freezing peaches whole, and although it takes up more space, they actually turned out pretty well. Run them under hot water and the peel slips off. After they thaw for a little while, you can slice them up. The peaches don’t brown at all because they’re still in their skins. A handy time saver! However you prepare your peaches for freezing, place your freezer bags or containers as quickly as possible into the coldest part of your freezer, allowing room around the containers to promote fast freezing. Containers can be packed more economically space-wise after one day of freezing. Be sure to date your packages. After you have eaten a few peaches, clean the pits and store them in the refrigerator until September or October. Plant the pits about five inches beneath the soil surface. It’s best to plant a few in case some don’t sprout. Your tree will begin to grow in the spring! Keep the tree watered and fertilized and you’ll have fruit in 2-3 years! Loved, loved, loved the peaches!!! Besides standing over the kitchen sink with juice dripping down my chin, I made peach ice cream, peach cobble, and put up 8 pints of peaches in mason jars to enjoy later. Thanks for making Franklin a drop off point. I will definately be participating again! When we first picked up the peaches they were a little firm (unripe). After 24 hours they began to soften and they were delicious! Our family of 8 has eaten over half of our 1/2 bushel in 5 days and I have about 20 peaches left. I plan to freeze them tomorrow to make peach sauce to use with pancakes and waffles later in the year. We blend a cup of fruit with 1/4 c honey and 1 cup of orange /apple juice and bring to a boil. Mix 1 tsp corn starch with some OJ and whisk together then add to boiled mixture after removing from heat. Whisk together and serve over fresh pancakes/waffles! YUMMY! Thanks, enjoyed the peaches very much! I will be watching my email and ordering again. So will everyone else that I ordered for also. They all loved their peaches too! Thank you for the peaches. We enjoyed each one of them. Regarding the peaches- We loved them and if you order more would like to get more. There was not a bad one in the batch! The peaches were yummy and they were grown about an hour from my hometown in GA! I liked the peaches very well. I canned a batch for a food preservation demo, but the rest we have ripened a few at a time, and eaten them fresh. Very good!!! We just got back from Switzerland where they make fruit fladas. They are so good!!! You make a crust of your choice, and spread it on a cookie sheet. Then spread some fresh fruit about 1/2 to 1 inch thick (like plumb halves or cherries or peaches). Pour a sauce over the fruit with some sweetening, flavor, corn starch or flour to keep from being too runny and some nuts or soy or milk for richness. Bake till done (crust is golden)Then enjoy!!! We live up in KY and we ordered 4 cases of peaches from you last month…they were wonderful!!! The people in Hartsville were kind enough to hold them for us until we made it to town. Thanks for the reminder, Erin, but we are going to California to visit our son and his family – no time for peaches – but the last ones were absolutely delicious – we ate every last one of them! The “seconds” were just PERFECT! We loved the peaches! We froze all of ours since I am the smoothie queen! My only regret is that I didn’t have that peach party like those others with all those extra hands! They were excellent. Hope you order again. There are some people in the plant that would like to order too. We thought the peaches were great! Very tasty and they are keeping well. Delicious peaches! We are eating them by themselves, over cereal, in smoothies and will be freezing a lot of them too. Thanks! They were a little bit green but as they mature they are VERY GOOD! Look forward to more and especially Michigan Apples. I waited until Monday and they were perfect for canning. I just had trouble keeping my dear hubby out of them so I would have some to can. I’ll order again next year. The peaches were fantastic. Keep up the good work. Thanks again. Just canned the peaches last night. They look beautiful. The peaches were great! Not only were they flavorful, they were huge. Some of the best peaches we’ve had all summer! I really enjoyed the peaches. They were a little firmer than the last batch but after a few days were ready to can. We canned 2 boxes and got 30 quarts of peaches. That is a quart per dollar spent…not bad. We also made peach honey with the skins for pancakes in the morning. Our one box of eating peaches has kept well in the fridge so far, now if I can only hide them from the kids. The freestone variety has made for easier canning. Great peaches! Big, juicy and delicious! We have NEVER been disappointed in the fruit we’ve gotten through you – thanks! LOVED the peaches!!! They were very good. Better than the last batch. They were juicy, and oh so flavorful! The July peaches are fabulous! Mostly ripe and perfectly sweet – delicious flavor I remember from childhood. We were worried about ordering #2 peaches, but SO pleased! We’ve frozen some, made peach pies, peach and ginger soup, grilled peaches with honey glaze, given some to neighbors, and of course, eaten quite a few. Thank you! The peaches were awesome. Sweet and easy to eat! We made peach syrup for our pancakes and plan to freeze many of them for smoothies! Wonderfully sweet! Thanks! These peaches were much sweeter than the June peaches, but ripened very quick. We were very happy with them. We canned 5 of the 7 boxes, and were able to put up 68 quarts. The other 2 boxes are for fresh eating. Thanks for getting these peaches for us. The peaches taste amazing, but the quality is not as good as the June peaches. We are just eating the ones that have bad spots day-to-day. They seem more banged up this time. We LOVED the June peaches we got! I loved the freestone peaches-& while I enjoyed the June peaches, I won’t be ordering any semi-freestone next year, it’ll be ALL freestone for me. The taste was better & working with them was TONS easier. I did notice more bruising, but maybe that was in the handling or be cause they were a bit more ripe than the semi-freestones? I didn’t can these. I froze one box & dried another in our Excalibur dehydrator, then vacuum-sealed them. The peaches were absolutely wonderful!! Again> We were more than pleased with our peach order; We put up 18 pints of gourmet looking preseves and 11 quarts in the freezer. The last order and with this order, we put 22 quart boxes in the freezer for our favorite dessert, peach cobler. We are looking forward to getting pears for perserves. Also, we are hoping next year there will be cucumbers for pickles. The peaches were delicious. We just bought one bushel. I made two cobblers, a pie, shared some with friends and we ate the rest. Oh, I also froze some. They were some of the best peaches we have ever had. Very good flavor and in very good shape. Excellent! We have eaten several fresh. we have made preserves, peach pies, a peach cobbler and frozen sliced peaches! In a word, fabulous! Thank you! My peaches were wonderful! I still had plenty frozen from June (I don’t know how to can yet! ), so in addition to what we could eat and bake, I was able to give a half dozen or so to neighbors in nice little gift bags as a little summer gift. They have all LOVED them! Thanks! They are beautiful and tasty. I am very pleased with the “seconds” I received. Thank you! The peaches are delicious. We think they are more flavorful than the June peaches, which we also enjoyed. We are not canning or preserving, just eating them. I thought the peaches were delicious. Had I known they were so good, I would have ordered more. The peaches were awesome! Very sweet and juicy. Thank you! The peaches were incredible, just like the last time. I had to wait a few days for them to ripen, but I was glad for that (who wants to spend the entire weekend putting up peaches?). They are juicy and have fantastic flavor. Can’t wait to use them all winter long! The peaches were wonderfully juicy and sweet! We froze some for smoothies and cobblers, made some preserves, and ate some–yum! I ordered 2nd’s. They were rock hard when I received them, which surprised me because 2nd’s are usually overripe. I let them sit for 2 days and then was able to process them. They were delicious. We really enjoyed July’s peaches. June’s were good, but I think that July’s were better. They seemed to be a little better quality, because they came off the pit easier and lasted longer than last month’s. They, also, were delicious. We quick froze sliced peaches for smoothies, and canned peach jam and peach butter. Thanks for providing this co-op. I think that these peaches were wonderful. What I loved the most is that they were nice and big, and juicy as well. Keep up the good work Erin-N-Family. This was our first order of peaches. We were very happy with our box. We got a box of “number 2” peaches, but they looked and tasted beautiful. My peaches had a lot of bruises for some reason this time – but they were the best tasting we’ve ever had so I can’t complain. Last month we had hardly any bruises and those were absolutley delicious, but I do think these are even a little better. We loved our peaches!!! I like them better than the June ones because the stones seem to come out easier and they have been much sweeter. We didn’t do anything with ours but share with others and eat them as is. The peaches are wonderful. It took about 2 days to be ready to process. We still have some fresh ones and LOVE them. Thanx. When I saw the peaches, I said oh how beautiful! I knew immediately that they were going to be good. Joyce had an extra box so ended up with two! I thought well they just need a few days and they will be ripe, but I cut into one right away it was sooo juicy and sweet, just love ‘um. Froze quite a few gave some to neighbors, and left some for eating, they were worth every penny and then some:) Thank you! These were the best peaches we’ve had almost ever. Could have sold alot more, and used more. Thanks for your efforts to help us get them. The peaches were wonderful. We loved them. My peaches are still delicious and my whole family has thoroughly enjoyed them. Thanks! WOW! The peaches were GREAT! The first box I got, I put up 26 1/2 pints and the rest went into the freezer, except for the cobbler I made that nite. The 2nd box I got, I put up 21 pints, this is all jam by the way. Yum! Yum! I only work with the pint and 1/2 pint jars since it’s just the 2 of us. But we really enjoyed them and the flavor was GREAT! Thanks. Heather and everyone that’s enjoyng the jam. The peaches were delicious. A few days after pick-up, we canned 7 quarts and froze 2. They were great!!!! We ate a couple of them and made jam out of the rest. I wasn’t able to get to them until Tuesday. They were in great condition and perfectly sweet!! The peaches were delicious. They were a little on the expensive side but we really enjoyed them. Love the peaches. They are sweet and juicy once they get ripe. Love the price, too! We’ve never tasted a peach that was so delicious!!! They were incredible! I ordered a box of the seconds and they sooooo good. Thank you for a another wonderful fruit order. Loved the peaches. I received seconds and they were above my expectation! Keep them coming! Beautiful peaches, even though they were called 2nds. I was thrilled. The look so pretty in all those jars on my shelves!!! Excellent – the peaches were delicious and now I have a freezer full to enjoy all winter! The peaches we got in July were awesome! Just want to say the blueberries and the peaches are WONDERFUL!! Tonight I put up the blueberries and I will work on freezing the peaches tomorrow. Thank you again! S.S. The blueberries were fresh and absolutely delicious. We can’t stop eating them plain :-) We bought “seconds” on the peaches. Many of them were partly green and hard when we got them. They have softened up and the part of the peach that isn’t green is yummy, but the green parts didn’t get any more ripe and are not good. I don’t know if they are seconds because of the green/not-ripe peaches. I hope the next batch will be better. -Rebecca B. Just got back in town and a friend had delivered my peaches and blueberries to my house. They are absolutely WONDERFUL!!!! We already went blueberry picking twice this year, and I love that for the experience for the children and for the freshness, but your berries were just way better than those we picked! And I try to buy my peaches fresh too–from the guy who sets up a stand on the road, but they were not good at all this year. These peaches are SO much better. Sweet, juicy–the way a peach should be. Thank you so much for providing a way for us to get such good produce! The blueberries and peaches both are VERY good! I’ve been buying blueberries at WalMart all summer and these are far superior with fewer underripe and rotten ones and excellent flavor. This is my way of putting in a request for another blueberry delivery, if possible. Your source for blueberries is wonderful. My friend, an organic farmer, and I did a side by side comparison of blueberries available at a farmers market here in middle TN (she said their berries are the best of the market). The ones from BNF won by a mile. So I am hoping there will be another blueberry delivery soon! For sure I’d buy at least 2 boxes! 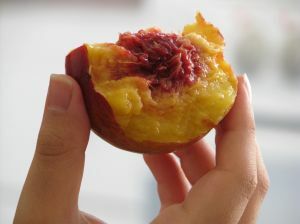 *BNF* Some peaches have a natural, white, bumpy substance around the pit that is completely normal. It is not mold. It’s perfectly fine to eat, can, or freeze peaches that have this white stuff around the pit. Our first 2 boxes of peaches were amazing! I’m so excited to have found you! I just worked up my first box of peaches – I am so happy with them. Thanks. -S.K. The peaches is this order were a lot larger and beautiful. We enjoyed them as much as the first order, but since they were bigger they were quicker to work up. I canned 14 quarts, froze 4 gallons, make a peach cobbler, and ate lots of fresh peaches . You have to enjoy them while they are here. Thanks again for getting the peaches, they are wonderful! We ate some and canned some. Thank you for all you do to make available the produce you locate. The peaches have a tremendous flavor.We are eating them all the time.This batch seemed to be “squished” down into the box as at least 2/3rds had smashed bruise spots on them. This was not the case from the shipment we received about a month ago. I appreciate the more natural growing practices and the flavor is perfect. Just wish there had not been so many bruised peaches. Thank you. -Pat G.
Took some to Maryland to share, made them a peach cobbler. Got back home, made a cobbler for us, ate a few yum. . .still have enough for homemade ice cream. Just want to let you know that the peaches are incredible!!! My husband NEVER liked peaches all his life until he tried these ones. He loves them!!! Thank you for finding theses wonderful peaches and providing us with healthy and delicious produce. First of all thank you for providing this nice service. This was my first time ordering and I ordered 2 boxes of peaches. They were seconds so I did not expect perfection. The one box was fine but the second box was super seconds all green and oddly shaped. Not a pretty peach in the bunch. Still looking forward to the freestones coming in! These were so good! Our family of 4 has eaten all 25 pounds of peaches in one week! We got the number 2 peaches and some were small but of good quality. I would suggest separating your peaches right away when you get home, then giving the less ripe fruit a couple of days out of refrigeration to ripen. Then eat them quick or freeze them because they don’t last long. We are looking forward to the next peach order. We are so glad a friend introduced us to Bulk Natural Foods. The peaches were absolutely delicious!!! We made peach jam and peach cobbler with them. Look forward to ordering with Bulk Natural Foods again!! Did anyone else have trouble with their peaches going bad? I got a box of #2’s. We’ve been eating them fresh and loving them, but I noticed this morning that I hardly have any left that don’t have rotting spots. Now, the potatoes, green beans and tomatoes are awesome! No complaints from me on those. I will have to send a picture later. peaches are to die for- wish I’d bought the extra box! We were extremely pleased with the freshness, ripeness and flavor of the peaches we ordered. We were so pleasantly surprised! We will definitely be ordering again and could not be happier with what we received. We were all pleasantly surprised with our peaches. We were expecting rock-hard fruits with not much taste. While they were not sweet like later summer peaches, they are juicy and refreshing and the non-cling pit is NOT a problem, since the fruit is so pliable and easy to eat around the pit or just work it out. I made delicious peach ice cream by taking out some softer peaches, cutting them and sitting them in a strainer under a bowl to catch the juice. Then I peeled the skins off the sections and put that with the juice. I just purchased Pomona pectin for jam making and decided to give it a try with the reserved juice and skins. I cooked the skins and pureed with a stick blender. I had exactly enough for the specified recipe on the instruction sheet. The puree was a nice rosy-apricot color. It made 2 pint jars. Now back to thet cut up fruit. I diced the sections. Mixed up milk, cream, vanilla, sugar, salt, arrowroot and my extra special secret ingredient. I mixed in half the reserved fruit and mashed it with a potato masher. I put it in my ice cream maker. When almost done, I added the remaining peach pieces. for this recipe, my cream was a little ‘soured’ so I added extra sugar to balance it. It came out tasting comparable to a famous store brand. All the boys raved about it! I loved it of course, although it was a little too sweet for me. The delicate pieces of frozen peach explode in every spoonful. All happy here! If there was a downside, it was that the peaches were much riper than I expected (as mentioned above). My fridge space is limited, and it got really hot here in middle TN, so I had lots more on my hands that I had to process quickly. But I managed to get a bunch in the fridge for eating too. The peaches were fantastic…after sharing with our neighbors, they went into the freezer! The green beans and potatoes and tomatoes are excellent as well as the peaches. “This was my first experience and it was very positive. I really had no idea just how many peaches are in a 25 lb box….a lot!! But we’ve greatly enjoyed them. There were 3 that had mold on them…some uniquely shaped ones, but all were very juicy. Some not quite as ripe as others, but that was a blessing…there’s only so many peaches you can eat at one time! So we have some cut up to use on ice cream , yogurt and breakfast cereals….some in the freezer for future use and some in the fridge drawer just to snack on. I will definitely order again. Oh! And the pick up spot in Spring Hill on Rustic….? was very organized and even helped me load my order! They were great! This is my first time to purchase from you and these are the BEST peaches I’ve ever had! They were juicy, the texture amazing and the taste superb! My oldest daughter was home from college and couldn’t quit eating them! We have also frozen them and look forward to future eatings. Thanks for this opportunity and I’ll be ordering again! Wonderful tasty treats in small packages! We are enjoying the #2 peaches! Mostly we have been eating them as they are. Made some ice cream on Memorial Day. Taking them cut up to my father-in-law who is in a nursing home…it’s such a treat! They were so yummy! Made 18 jars of jam. The peaches were so good fresh and in the cobbler. My whole family enjoyed them very much. The tomatoes were also very tasty. I love this co op!!! Thank you for delicious peaches AGAIN! As long as I get them straight to refrigeration they last quite a while. Our family loved digging right in and eating these cling peaches for our after-dinner snack (and throughout the day, too!). They’re small enough for the kids’ hands, but a nice size for adults, too. Juicy, sweet, and tasty! We highly recommend these peaches! All I received were the peaches and they were(are) delicious. One, maybe two, had a small bruise but I was well pleased and so glad to have my all-time favorite fruit again. Thanks much! The peaches are absolutely delicious! These peaches were excellent! They were so sweet, I didn’t even have time to make anything because my family ate about 2 or 3 a day EACH! After a few days they did get very soft, but still tasted great! I have really enjoyed this co-op, and can’t wait until the next peach order! :) Thanks! the peaches were some of teh juiciest peaches I have ever had. Very good. This shipment of peaches was absolutely delicious. Sweet and juicy. Made a delicious fresh peach pie on Memorial Day, but can’t send a picture because it was gone in 60 seconds. The number two peaches were wonderfully juicy and sweet. For cling peaches, they seemed remarkably easy to slice and seperate from the stone. Thanks for your video recommendations and tastings as they help steer me in making purchases I enjoy. The peaches were awesome! I shared them with family and friend. I will wait to make pies until the freestone comes in. from peach puree and honey =yum. tomatoes were delicous too – I wasn’t sure if it was supposed to be a full peck box there was room for 6 or so more tomatoes but the 14 we recieved were wonderful. We enjoyed eating them fresh by themselves and they were delicious in a salad as well. We’ve frozen some to use in desserts and smoothies. Can’t wait for the next batch! The peaches are so good. We made peach ice cream last night and it was amazing! I only added about one tablespoon of honey to sweeten it because the peaches were so juicy and sweet. Some of the best peaches i have ever had! Super Juicy! Can’t wait to order more! Last year’s peaches were SO good. These are just okay. My #2s are very much #2s this year, which doesn’t help – lots of bruises. Also, the case seemed to be missing a layer of peaches because there was quite a bit of empty space. If this were my only experience, I would not purchase again. When I first received the peaches, they were not ripe. After two days, they were somewhat overripe. They were sweet and juicy. I have given away a bunch of the peaches, throw away some, and made peach cobbler. The peaches really were great- we have eaten them fresh and my boys loved them! And what a great price too! Yes, they were GREAT and the kids loved them! The peaches had awesome flavor! We had a handful that were spoiled/overripe, but for the most part they were excellent for eating. We DID make a peach cobbler and it was eaten very quickly with rave reviews on the flavor!! The peaches were awesome. There were some bruised, but I just peeled those, put fruit fresh on them and put them in the refrigerator to eat. Very juicy and good to eat. We got the #2 peaches and they were amazing! I can’t imagine how the #1 peaches could be better unless it is only in appearance! What a great price for outstanding peaches! Excellent Peaches!!!!!!!!!!!!!!!!!!! Quality was top shelf. We have to eat them over a sink they are so juicy. We will definately take advantage of future buying opportunities. Thanks folks!!!!! The peaches were very tasty and the tomatoes were the best I have tasted since I was a small child on my grandfather’s farm and we would eat them straight out of the garden! My Number 2 peaches were/are great. Super taste & perfectly fresh & juicy. I did take a peek in my friend’s peaches (#1) I picked up for her. They were bigger & “prettier”, but I don’t see how they could’ve tasted any better than mine. (: I can’t believe I’m saying this, in light of my raving about the peaches, but our red potatoes were the star of the show! Yes, I just said POTATOES were the star! I regularly purchse organic potatoes at the grocery store which I thought were “fresh” & “tasty.” But I knew as soon as I cut these potatoes they were something special. Yes, I just said potatoes were SPECIAL! Crisp, pure white, did I say crisp! Made our parmesan roasted new potato dish DELISH! Kids ate em up. Grandparents ate em up. Looking for aq good reason to make more. Maybe potato salad, boiled potatoes with butter, and peach cobbler for supper!! I will order more produce next time. And please, locate that same potato farmer..if I wasn’t already married..Just kidding about that last part! The peaches were delicious and wonderfully juicy and the pits were not hard to get out. We bought 50lbs, to makes preserves, peach compote, and to freeze abunch so we can have peach cobbler or peach ice tea when ever we want.plus it is so easy to freeze them. You just put them individually in freezer and freeze them whole and take them out as you need them! Oh,and they smelled wonderful, i had to bite into one before i even got home frompick up, thet were just soooo good! Our peaches, green beans, and tomatoes were awesome. It has been great to taste this good flavors we can’t get from the store. Ymmm! We have made garlic great beans, slightly steam and stir fry in some butter and olive oil with lots of garlic add a touch of water for it to steam, salt and pepper to taste. (like at Chinese restaurant). We have been eating peaches plain, quick cobbler, and sliced for fresh home made ice cream. Now I am wondering how soon I should freeze some. We like to add tomatoes to grilled cheese sandwiches (add after cheese melts to keep tomatoe cooler). Delicious summer peaches! I froze six quarts of them, made two peach cobblers that were fabulous, and we are enjoying the rest of them in smoothies or just eating them over the sink while the juice runs down our hands. I ordered 2 cases of the number 2 peaches, We started eating them on friday. The first box was mostly good, but seemed to rot quickly. I opened the second box on Monday to start cutting up to freeze and a lot of them were rotten or bruised really bad. They had a good taste, but was a little disappointed. These peaches were wonderful. I’ve made peach salsa, peach cobbler, eaten them fresh and in oatmeal and given several away. I also made a batch of jam. The ones that fit in the fridge are still firm, but the ones that did not fit and I had to leave in the box are now starting to mold. Overall, I probably lost 3-4 whole peaches by Tuesday morning. A few were bruised or moldy fresh out of the box, but not enough for me to be concerned about. I will definitely order more and the price was awesome. The best cobbler recipe is one of Guy Fieri’s at Food Network. The peaches were so sweet I only added part of the sugar called for, but it still turned out divine. The peaches we bought in May, even though not free stone, are some of the best I have ever eaten. They are very juicy, too. We have used them in desserts, cereal, yogurt, smoothies and eaten them plain. One of my favorite ways to eat them is cut up in cooked oatmeal with agave sweetener and a drop or two of almond extract…..absolutely delicious!! We got the #2 peaches and had no problems with them. I ordered three of the number 2 peaches, 2 for myself and 1 for a friend. I wish I would have ordered more for myself. They went fast! I canned 12 quarts, made peach coffee cake, making peach cobbler for dessert tonight and the rest were eaten by the family. They were delicious! 4 peach cobblers! 2 weekends of peach ice cream! Peaches on our cereal! Bowls of peaches for breakfasts and snacks! …and we are still not tired of them! I have not had peaches that good since I was a little girl at my grandmother’s. That has been about 35 years. I will be ordering more. Thanks.